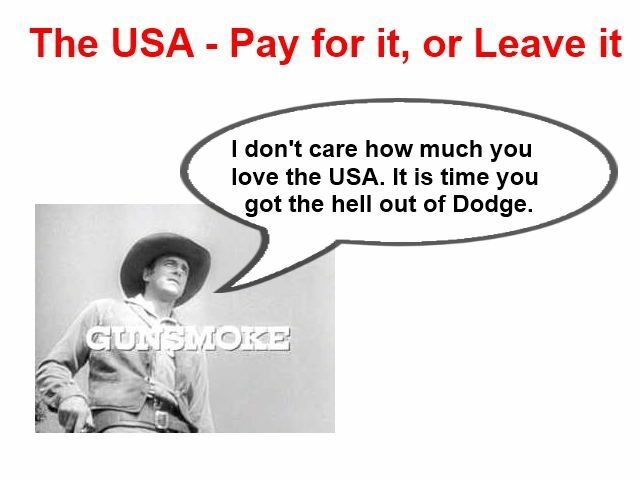 Is 2014 the USA Love It or Leave It Tipping Point? I believe I will be forced to leave the USA in 2014. It is becoming tempting to emigrate to Canada or Europe. I want to love the USA, I want to be an American, and I will forever be grateful to the USA for my American passport. And as best I can tell, I will be exempt from the “forced-to-buy-health-insurance” plan in 2014 ... yet this is still scary stuff. I believe it is prudent to make plans on how to technically reside in another country for tax purposes. However, I am not going to apply for residency in another country, which is tantamount to putting my name on their tax-collection rolls. I am making plans to become a man who does not need the USA, which is sadly the tipping point. I have always made plans to stay American, and now I am on the downward slope and making plans to not be American. I know what you mean Andy. I love America but I do not love the way our government has been doing things since Nam. If I could I would have departed a long time ago but I am unable to do so permanently. I have always thought that traveling and living in other countries is a great way to spend one's life and I have done a bit of that. As for taxes hopefully you can avoid paying too much, it's ridiculous how the rich keep getting richer and often not paying much in taxes due to all the loopholes that seem to favor the wealthy. I have no problem with wealthy people, I have never envied them as such, but I do think they should be paying a fair share. Oh well we can all discuss this into the ground and never get anywhere with it. There are innumerable small hassles for me here in the USA, and if I need to buy Health Insurance that is of no value to me, I have no reason to return. My friends from American who live abroad always laugh when I am in country, but this type of empathy is not possible when you have never lived out-country for at least 5-10 years. We really cannot understand a negative, and that is the problem, I do know the other side, and again innumerable problems here in the USA, and no reason to point them out. But, again the Health Plan would be a tipping point to me. I am seeing about getting another 10 year passport so there is no reason to return for 10 years. R. G. I do not know how you think your money will go farther in Europe. I lived there for over 8 yrs and visit every few yrs. The Euro even when down has still remained higher than our dollar and even the (at one time) cheaper countries are now more costly to live in. The Euro has done it's job by making them all a lot more equal. I understand there are some areas where it's a little cheaper to live but in general I wouldn't want to live in them as they are generally isolated. The last time I went to Italy I was planning on buying a small villa or condo but the Euro and the Italian property tax structure stopped me cold. Also the basic "free ride" health benefits throughout Europe are also being cut back. Anyway good luck in the future because once the world economy stabilizes (it always does) things will only cost more. I deleted and banned the comment, disrespect is not tolerated. "Under the law, most individuals who can afford it will be required to obtain basic health insurance coverage or pay a fee to help offset the costs of caring for uninsured Americans. If affordable coverage is not available to an individual, he or she will be eligible for an exemption. Effective January 1, 2014." Does that really sound so bad? What sounds bad is being forced to pay a fee t take care of others who don't take care of themselves to begin with. For instance, obesity has now been defined as a medical problem. Why should I have to pay for smokers, overweight, alkies, etc that don't try to take care of them selves? That sounds bad to me. Like any gov law there are always going to be loopholes that many will take advantage of. I do think we need good health coverage for all with limits based on those who don't try to take care of themselves and paid with basic tax money, but that's just me. Bruce, there are two caveats? What do I need to do to prove this? I am NOT inside the USA to protect myself? At some point I reach my tipping point, the point where I am tired of trying to answer questions. I went to the doctor for Free in the Dominican Republic. I paid 8 in Guatemala. Thailand was 2 dollars, and they are saying may add a fee to the Visa for Thailand that grants people Health Insurance. I love my country, but there is point where I am tired of paperwork, that I have the easy power to avoid. In most ways, I will probably become a man without a country. I am not going to sign up for residency for another country so I can be on their tax rolls. @Gadget: You ask two very reasonable questions to which I have no answer. I suspect, and I suspect that you suspect, that if you just keep on doing what you do so well, they'll leave you alone. I would submit that the US has no monopoly on paperwork. Surely you can think of other examples. My favorite is my friend Rob's story of living in Algeria and being asked for the Certificate de Existence. He replied, "but I exist!" but was told, "non monsieur, you need the Certificate de Existence!" Another is the story of my friend who wanted to get married in Belgium. She was told that she must have the state of Texas send the Certificate of Marriageability and that she couldn't get married in Belgium without it. She ultimately got married in Texas, instead. 'Tis not money that makes the world go 'round. It's paperwork. @Bill: There is a logical flaw in your response. If you are paying the fee, then you are uninsured. The fee helps to pay for the uninsured. Therefore, if you are paying the fee, you are paying for yourself. Under the previous system, and any system that I know of, it was already true that those of us who pay for health insurance pay for people who neglect their health. This is nothing new. The only consolation is that people with insurance can afford to see a doctor frequently for preventative care. If they do that they are going to be warned about health risks. They may not listen, but at least they hear the warning. My doctor, for one, has plastered his walls with posters about the dangers of dietary sugar and obesity. Regardless how the system eventually pans out there will be the usual problems that for many people will make it a total pain in the but. It's a gov mandated system so we all know that it has no chance of working perfectly. There will be those it helps, those it hurts and those who some how avoid it and could care less about all of it. Like I said I think taxes should cover any fees and that would make it a little simpler (maybe?). There are a lot of Americans that are full time expats and I doubt the majority could care about any of this other than if it takes a large amount of funds from their income to pay fees that they cannot avoid paying. Note: anyone that wants to get married in Europe without any problems should go to Denmark it is basically the Nevada of Europe. Many military go there to do so. It's cheap, quick and easy. Only thing is if you have been divorced you do need your paperwork. I married my ex there. Enjoy every one, hail Caesar and his stupid laws. "I would submit that the US has no monopoly on paperwork." Yes, Bruce, this is 100 percent correct, and the reason I refuse to apply for residency abroad. Why sign up for more paperwork, put myself on their radar? Sign up for what, to have them make me pay taxes? I suppose the government will leave me alone, yet all my life I have searched for simplicity, and understanding. And, when something is not obviously simple, I just say no. I have made up my mind to become a man without a country, even if I need feed them a plausible story, with no real basis in reality. Government normally accept a plausible excuse, they wait for the ones who just walk up and volunteer to have a problem.